When snow was coating the UK Abel & Cole contacted me asking if I would like to try one of their soya-free chickens. It’s an intriguing concept and not one I had really considered or come across before. As the majority of GM-free soya comes from Brazil, where rainforests are chopped down to make way for soya, Abel & Cole have looked into soya-free ways of chicken getting their protein for growth. I was pleased with the quality of the bird. I’m fortunate to have a very good supplier of organic, free range meat and will continue to use them, but for what ever reason I can’t get to them I’ll be giving Abel & Cole a call. Like the chicken we usually buy, this chicken came with the giblets. I’m always freaked out by the giblets. Half pig? fine, giblets stuffed up a chicken? um, no chance. Thank goodness for Hubby. I know I should have kept them to make the ultimate chicken stock, but I couldn’t bring myself to use them. Maybe I’ve eventually get over my gibletphobia. To cook the chicken I wanted to try pot-roasting, different from my usual way of cooking a chicken. Something I hadn’t tried with chicken. I was also yet another excuse to use my Le Creuset dish. Rarely does a week go by when I don’t use the Le Creuset dish I got for Christmas. I admit I’m a bit obsessed with it. I was pleased how it turned out. This method of roasting produced a succulent and tasty bird. The roasting juices were then used as a slightly sweet gravy. I’ll certainly cook a chicken again this way. 1.5kg whole free-range chicken with giblets removed. 1) Preheat oven to 220oc. Scatter the onion wedges over the bottom of the casserole pan then place chicken on top of the onions. Pour in the cider and sprinkle with thyme. Replace lid and roast in oven for 45 min. 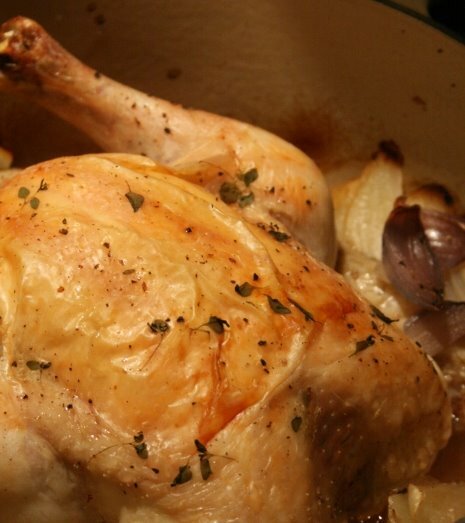 2) Uncover the chicken and roast for a further 45 min, until the chicken is cooked. Remove chicken from pan, wrap in foil and rest for 20 min. The remaining liquid in the pan can be used as a gravy. I admit, I’m quite frugal and refuse to throw good food away. The odd bit I do throw, usually because it has gone past edible point, always gets composted. After writing my Love Food Hate Waste post last year I’ve become better at reducing waste and the campaign is now getting people to think about new habits be it using leftovers or getting better at portion control. Bananas are an essential fruit in this house. 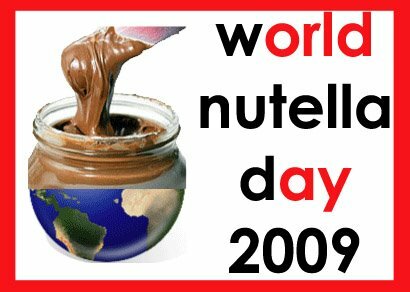 My breakfast is incomplete without one. Very rarely are they left in the fruit bowl, but with us being away last weekend we returned to 4 bananas looking a bit worse for ware. Not one to throw away food I set about making some banana bread. Another reason for baking a cake is that while in Axminster last weekend Hubby treated me to a set of Emma Bridgewater cake tins and I had to christen them. No more battered Roses tins for me. Actually come to think of it the last time I saw one of my Roses tins it was being used to try and save a poorly goldfish in the staffroom. Hmm I’ll now stick to my new tins and not let goldfish/stick insects be put in them! I use Nigella’s Banana bread recipe. It’s produces a perfect light and fluffy cake and the recipe doesn’t need changing in any way. You can also make it be replacing a bit of the flour with cocoa which is just as delicious. The walnuts give a nice texture to the loaf. As you can tell by the picture there isn’t much of it left! If you don’t have any very ripe bananas, peel them, cut them and blast them in the microwave for a few seconds until they have begun to soften. The one thing I would say is that if you use a mixer to make cakes by all means use it up to stage 2 then after that do it by hand or the walnuts get crushed. 1) In a small saucepan gently heat the rum and sultanas until boiling then take off the heat and cover. Leave for an hour or so to allow the sultanas to soak up the rum. 2)Preheat oven to 170oc. Beat together the butter and sugar then the eggs and bananas. 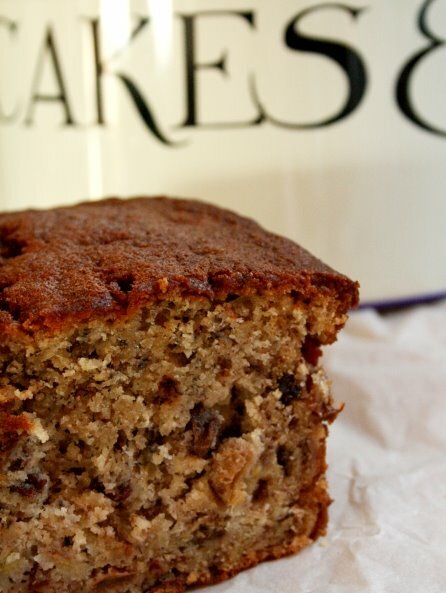 3) Stir in vanilla, walnuts and drained sultanas then slowly sift in the flour, baking powder, bicarb and salt. Fold until combined. Pour into a lined 2lb loaf time and bake for 1 – 1 1/4 hours. Allow to cool in tin before slicing. Sunday morning we awoke still full from the Valentine Feast and headed into Lyme Regis. Okay that is a slight lie we originally went somewhere else, but it was so dire we headed back to Lyme Regis. After eating the essential fish & chips along the sea front, while dodging nose-diving seagulls, we decided to find The Town Mill Bakery where our Bread Making course would start on the Monday. Well what a gem. 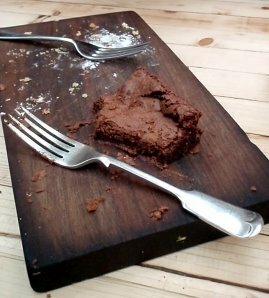 With two long benches and feel-good music pumping from the stereo we picked up a slab of wood and helped ourselves to the glorious cakes; cups of tea were then served at the table. Their brownies are one of the best I’ve ever tasted. I could have happily spent all day here drinking, eating and reading the cookbooks that adorn the bookshelves. If I was to run a bakery it would be exactly like this. For the last 2 nights of our trip we stayed at Hedgehog Corner, a B&B just down the road from RCHQ. Joy, the owner of the B&B, was a fantastic host and had thought of everything down to the salt & vinegar for your fish and chips to the torch and high-vis jacket for the walk to the pub. She also cooked a great breakfast and is very passionate about where the ingredients come from. More or less all of the ingredients were locally sourced. I can highly recommend her muesli. Monday morning we were back to Lyme Regis for 8.30 start at Town Mill Bakery. As we arrived we were met by Steve Lamb who recognised Hubby from Pig in a Day. In total there were 18 of us on the course and while waiting for everyone to arrived we tucked into tea and toast. The first part of the course was with Aidan Chapman, passionate Master Baker who let us in to some of his baking secrets and the philosophy behind bread making. I found him incredibly inspiring. He also explained the the Chorleywood Process and how supermarket bread is by no means “real” bread. He then demonstrated the sponge & dough method where less yeast and salt used. He also uses wheatgerm in the majority of his bread for depth of flavour and texture. We then had a small masterclass on kneading 1 handed (so you can do 2 loaves at a time) & shaping bread. It took me a while to master the technique but by the afternoon I had it down to a fine are, Hubby was certainly the teacher’s pet when it came to this! 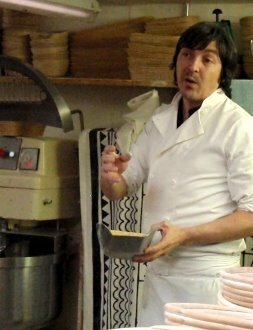 Aidan also explained how steam and how you slash the bread and significantly change a loaf. The longer and cleaner the slash the better. When putting my loaf into the giant industrial oven I was a bit over enthusiastic and sent my loaf straight to the back of the oven. I needed a bit of help to get it back out again! After our loaves were baked we headed in car convoy to RCHQ for the second half of the course. This was also to allow The Town Mill Bakery to open for customers. The next part of the course was being lead by Dan Stevens, who had been head chef at the Valentine Feast. The afternoon started with us making our own bread dough. Like usual I made an absolute mess, but in turn produced great bread dough. Dan showed us another method of kneading. We left the dough to rise while Dan explained different doughs and demonstrated how 1 basic dough mix could make lots of different types of bread including flat breads, foccacia and English muffins. The flat breads he made were divine with the beetroot hummus. I could have easily swiped it all up and sat in a corner eating it. Interestingly he said the bread he couldn’t master was naan bread. He concluded that the only way you can get naan bread as delicious as from the takeaway was to have a tandoori oven. What was interesting was that both Aidan & Dan recommended stones for cooking your bread on as it keeps it’s heat the best. Before lunch we all prepared a foccacia from the dough Dan had prepared earlier then set about making some pizzas for lunch. Then cooked them in the woodfired oven. The weather was so glorious we did this part of the day outside. The oven was so hot they cooked in less than 90 seconds and tasted so good. To accompany the pizza we also had some ham & purple sprouting broccoli gratin. After lunch Dan explained the theory behind sourdough and how to make our own. I’m very intrigued by this bread and am planning to start a “mother” this weekend. While our final loaf was baking in the woodfired oven we wondered around the grounds. 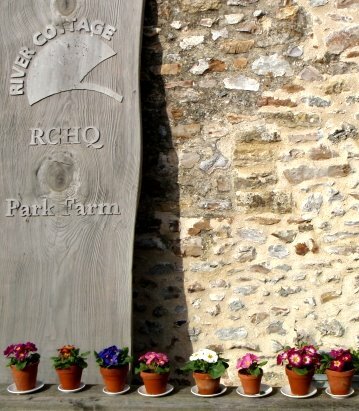 How I would love to own somewhere like River Cottage. We eventually left with 6 loaves of bread we had cooked between the 2 of us. Thank goodness for freezers! I’m very thankful for Hubby taking me away to River Cottage to not only experience the Valentine Feast but to learn so much on the bread course. I picked up so many tips and hope I can implement them into my baking. In turn I should produce even better bread. It has made me think completely differently about how I bake. What I did notice on the course that I was probably one of the more experienced in baking there and saying that I still think I have a great deal to learn. I put it down to my food geekyness! 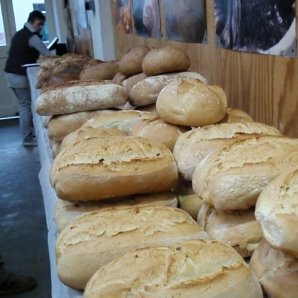 The course certainly wasn’t for bread beginners but keen home bakers and was the perfect way for expanding my knowledge. I would love to return for another course. My Christmas pressie off Hubby had finally arrived. After me giving him an early Christmas pressie in the shape of Pig in a Day with Hugh F-W he returned the favour by taking me away for 4 nights to experience River Cottage, not once, but twice. Saturday started with the obligatory trip to River Cottage Local Produce Store & Canteen. We arrived just as lunch service was starting and managed to grab a seat. The menu may be small with around 8 dishes, but the ingredients are seasonal and they are well priced. If I wasn’t dining at RCHQ later on I would have tried the fish & chips as it looked delicious, but instead had a hearty bowl of leek & potato soup with pumpkin seed & parsley pesto. The pesto transformed the dish from a delicious soup into an absolutely delicious soup. Hubby had faggots which impressed him as they had been made with the traditional caul fat. As we left there was a significant queue of people waiting for a table. 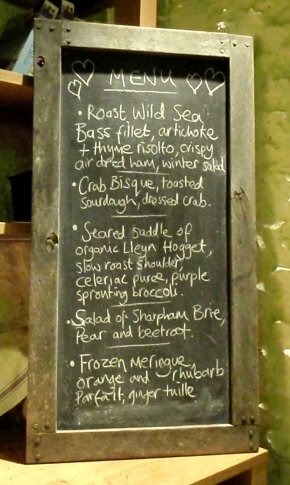 Saturday evening was the Valentines Feast at River Cottage HQ. It started when we pulled off the country lane into a car park. Everyone was huddling around a fire in an attempt to keep warm while waiting for the tractor trip down to RCHQ. RCHQ is very well hidden and you wouldn’t know it was there. Nestled in the valley below with minimal light pollution I just couldn’t see it. Now before I go any further I apologise for the grainy quality of the pics. I was using our compact rather than SLR and the “available light” setting to avoid using flash. No food pics, I’m far too self conscious for that! All I can assure you was that the food looked fantastic. The tractor & trailer arrived and we all squished onboard for the bumpy ride down to the farm. I can certainly understand why they don’t let you walk or drive down! At the bottom we were met by Peter, our host for the evening, who guided us to a lovely warm yurt where we were served a rhubarb Bellini and possibly the biggest oysters I’ve ever seen. I admit I chickened out of the oysters, but Hubby really enjoyed them. We then walked to the barn and found our seats next to a lovely couple from Birmingham. This valentines event was unlike conventional Valentine events. Rather than separate tables for couples we were seated down two long wooden tables. There was a really great atmosphere in the barn. Not long after the next canape was brought out; a rough pâté of belly pork served on a small circular piece of toast. This was soon followed by seared paprika squid. Once everyone had eaten their canapes Dan Stevens, Head Chef for the night, introduced the rest of the menu to us explaining where all the ingredients came from. I washed all of this beautiful food down with some Tayberry wine. Roast wild sea bass fillet, artichoke & thyme risotto, crispy air dried ham with winter salad – I’d never eaten sea bass before Saturday and would now have to say it is one of my favourite fish. The risotto was made with spelt rather than traditional rice which gave it a lovely texture. I would love to make this dish again at home. Crab bisque, sour dough and dressed crab – Probably my least favourite course as I do find crab a bit overpowering, but still a lovely dish. I especially liked the sour dough. Seared saddle of organic Llyen Hogget, slow roast shoulder with celeriac puree and purple sprouting broccoli – I’ve been wanting to try hogget for a while so when it appeared on the Valentines menu I was really pleased. As a hogget is older than a lamb and younger than mutton it had a strong lamb taste, almost very slightly gamey. The saddle was cooked to perfection with a hint of pink and the shoulder just melted in my mouth. I would quite happily eat hogget again, just a shame it can be difficult to get hold of. After the main course they brought out a bottle of Camel Valley Cornwall Brut for every couple. We weren’t expecting a bottle of bubbly at all so it was a nice surprise. The hardest bit for me was not drinking it all has Hubby was driving and I wanted to leave some for him once we got back to the hotel. It was very drinkable. Salad of Sharpham brie, pear and beetroot – Possibly the most interesting and my favourite course. The flavours, along with the digestive biscuits matched perfectly. The brie had been drizzled with a small amount of honey that really set the flavours off. Again another dish I would like to try and replicate at home. Frozen meringue, orange and rhubarb parfait with ginger tuille – A refreshing end to the meal. I’m not usually a fan of rhubarb but this was delicious. The evening ended about 11.30 with coffee and superb chocolates that were beautifully dark and just melted in my mouth. A perfect end to a perfect evening. 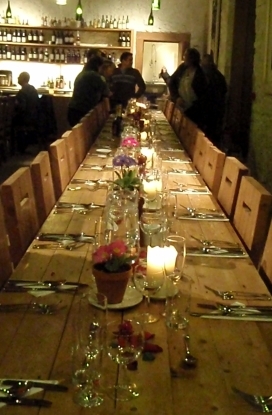 I would love to return to River Cottage again for an evening like this. It was a perfect place for me to try dishes I wouldn’t usually choose in a restaurant. 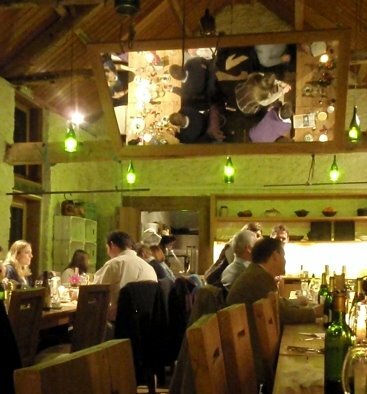 I would highly recommend a trip to eat at River Cottage to anyone. Click on for – part 2! We’re now a month into Cookery Club and it’s going v well. 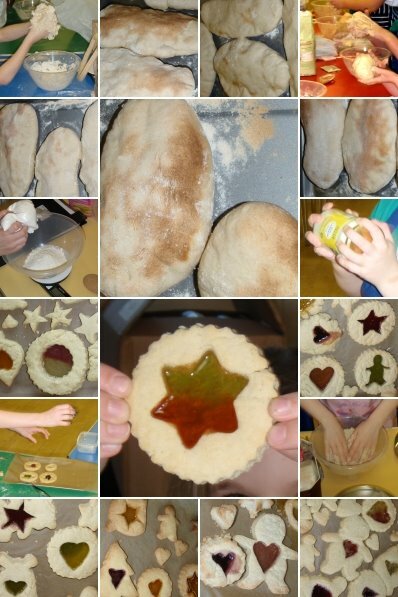 The Snow Days mucked one week up, but since my last update we have made pita bread, butter and stained glass biscuits but with shortbread (uses less ingredients!). There have been a few hiccups and it’s a steep learning curve for me, but the main thing is both me and the children are still enjoying it. I suppose the photos above prove how much they are enjoying it. The word has got around about my cookery club and they kids, bless them, are so proud of what they have achieved each week. I’m proud of them too. It’s been interesting to see which kids thrive in an cookery environment. Some of my best little chefs are the boys some of which can be difficult or disruptive in a normal classroom situation. A few of the kids have approached me with recipes they want to try. One would like us to make cinder toffee, I’m a bit scared trying this with 14 children due to the boiling sugar, but may demonstrate it for them as it is a great chemical reaction to see. 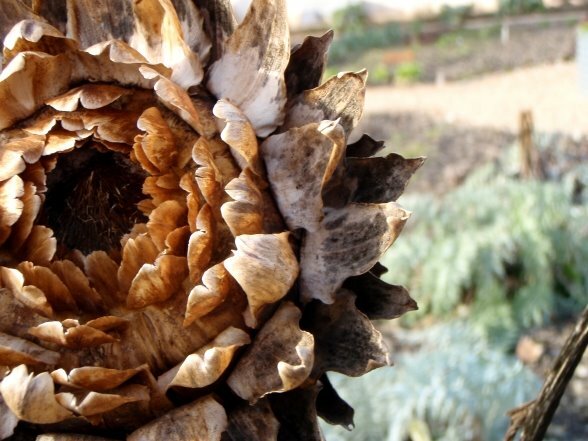 We have lots of exciting food projects planned for the next couple of weeks so watch this space! Snow Day Soup & Frolics. 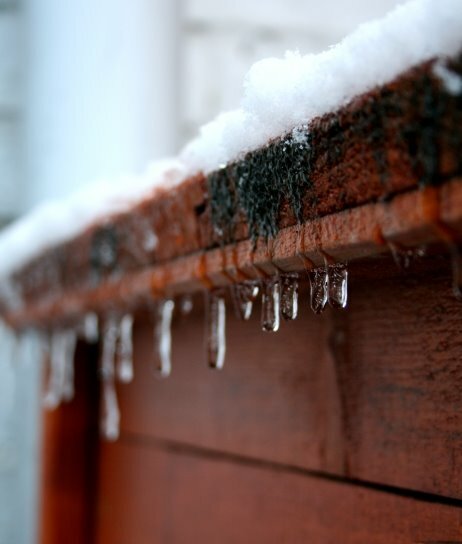 Since Sunday afternoon it’s been snowing and snowing…and snowing. Not the usual grey mushy stuff we have here in the UK but bona fide snowy powder, perfect for snowman making. Much excitement ensues when you work in Education as there is a possibility school will be closed and it will be officially declared a Snow Day. To be honest by 4am on Monday morning while watching Hubby slide up the drive for a days work in Brum (& consequently being stopped by the police and being told he was mad to drive to Brum) I decided I wasn’t going to work. The idea of sliding down the lanes filled me with fear. Instead I settled down to a day in the house. Not only Monday but today, Tuesday, was also declared Snow Day. As I’ve mentioned before, the residents of this little row of cottages come out in force when something is cracking off. Be it floods, powercuts or being snowed in we come together and sort the problem out then recover with a cup of tea…even if it is made on the BBQ during powercuts. Most of us were up and about today and yesterday clearing the snow along the private road we all live off. As it is a private road and doesn’t belong to any of us in the row (ah good old ancient boundary issues) it isn’t gritted, so after having to push each others cars up the road while sliding all over the place we decided some sandbags had to be sacrificed. The novelty of being stuck in the house soon wears off and with the snow outside I was itching to don the crampons and get out onto the hills. Not the cleverest idea considering I would be on my own so instead pulled on my funky wellies and a multitude of layers and headed up and out of the village. I really enjoyed my walk. 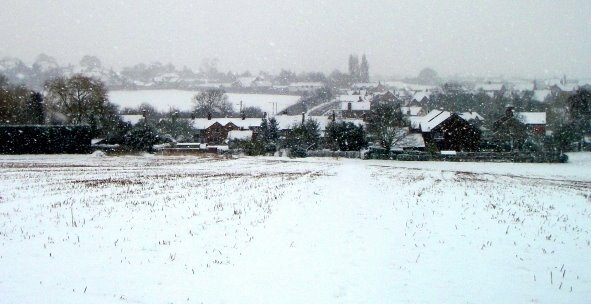 The land looked so beautiful and peaceful blanketed in snow. Mr Robin, the crazy thing, has been entertaining me (come on, he’s far better than Loose Women!) and kept dancing behind the suet feeder as I tried to get his photo. 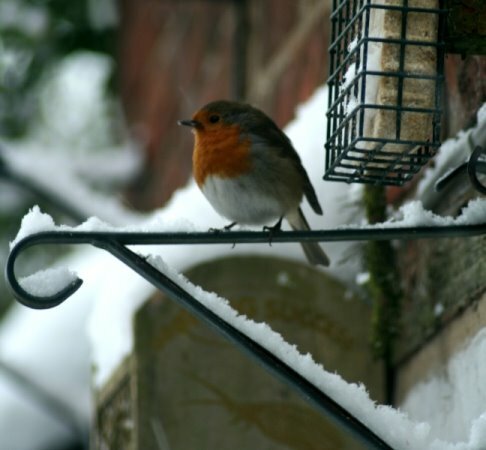 This is the same robin who sometimes likes to hop/dance back and forth across the garden step while singing at the top of his voice. I usually hear him before I see him. He does have a lady friend, but I haven’t seen her in a while. Today we have no milk, but main thing is I still have cream for my coffee and a few Raspberry Brownies to keep me company. It’s a bit of a hike to the nearest shop and it’s down country lanes. Hubby only got out of the drive this morning by me and the other neighbors pushing him. In my little car, there isn’t a chance of me getting out. I’ve taken the advantage to being snowed in by doing quite a bit of cooking. A week ago I received my signed copy of River Cottage Handbook: Bread. 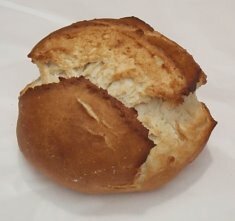 Since starting to make bread last year I’ve become more interested in the science behind bread and what makes it work. I’m really impressed with the book and is full of great advice, without being patronising like some books can be. 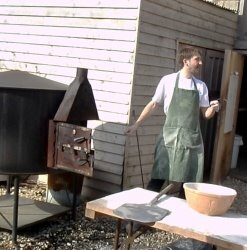 I’ll be meeting Daniel Stevens himself on a bread making course in a few weeks time. I made focaccia a few summers ago and it was dire, however by following Daniel’s recipe and advice I think I have just produced the best piece of bread I have ever baked. The bread was so good I had to go back for more. I’ve decided Dan is my new hero! 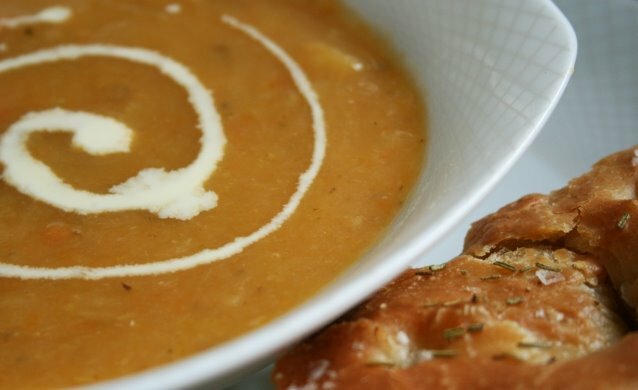 To accompany the bread I made some Snow Day Soup using the veg I could find languishing in the fridge. I don’t really have a recipe for this but essentially gather all the veg you can find (in my case carrots, leeks and a small potato), gently fry off the leeks. Throw in a clove of garlic, the rest of the veg, a bay leaf and 800ml of veg stock. Simmer for 30 min then blitz in the blender. Being married to a man who was brought up close to the UK’s heart of brewing, it’s not surprising that his interest in beer has rubbed off on me. I could quite happily sup on a half pint of porter, but my ultimate favourite has to be Samuel Smith’s fruit beers especially the raspberry one as it tastes of summer. The taste of summer is just what we need as the snow is beginning to settle outside. After stocking up on some of the beer at Sound Bites in Derby yesterday, I had a brainwave on the drive home. 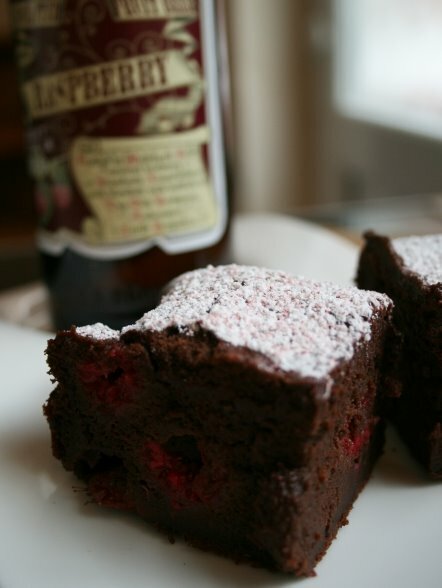 You can make brownies with Guinness, so surely you can do the same with glorious Raspberry beer. I also made them to celebrate having 100,000 hits on my blog since it started. To add some additional colour to the brownies I stirred some raspberries into the batter. 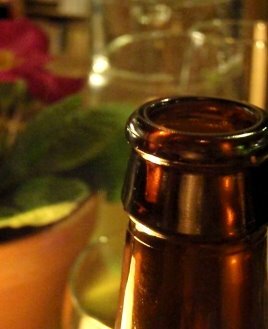 To be honest, I cook with beer just as much as I drink it and like wines different beers go with different dishes. The smell of the brownie batter as I made these was divine and once cooked they tasted like my raspberry truffles in a gooey cake form, can’t be bad! Just note, if you do make these it makes quite a sloppy batter, but don’t worry they will still bake well. 1) Preheat oven to 190oc and line a deep 8 inch square baking pan with baking parchment. 3) Stir chocolate mix into egg mix. Sift in flour and cocoa. Beat until well combined. 4) Whisk in beer then fold in raspberries. Pour batter into the pan pan. Bake for 25 min until a skewer comes out just about clean. It will continue to cook slightly after being taken out of oven. 5) Once cooled, drench in icing sugar and slice.